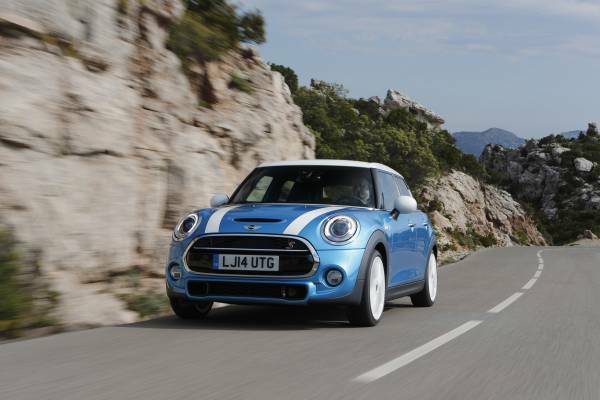 Woodcliff Lake, NJ – November 19, 2014…The new MINI Hardtop 4 Door will make its North American premiere at the Los Angeles International Auto Show, with an intent to redefine what is expected from the premium small car segment. Originally showcased at the Paris Motor Show in September, the new four door model of the iconic MINI Hardtop will be shown for the first time in the United States at MINI’s press conference at South Hall #503, November 19, 2014, 4:40 pm PT. As if the presence of the MINI Hardtop 4 Door wasn’t enough to draw a crowd in the city of angels, the stunning MINI Superleggera Vision roadster concept will also be on display for the first time in the U.S., along with a classic Mini. The three-car feature display will serve as a visual of the past, present and future vision for one of the world’s most recognizable cars. Even with its four doors, seating for five and added cargo space, the new MINI Hardtop 4 Door maintains the dynamic character and go-kart handling of the 2 door model while adding functionality and interior space. The MINI Hardtop 4 door has more legroom in the rear, more shoulder space in the front and back and additional cargo space compared to the 2 door model making it more practical for a family or owners just looking for more MINI. The MINI Hardtop 4 Door is the first four door MINI to be built on the shared front wheel drive global architecture with BMW Group and will be powered by the same three- and four-cylinder MINI TwinPower Turbo Technology engines found in the MINI Hardtop 2 Door model. The new MINI Hardtop 4 door goes on sale in January 2015 in the U.S. and is priced at $1,000 USD above the equivalent MINI Hardtop 2 door. Forward looking design has always been a part of the inspiration behind MINI. The iconic classic Mini created by Alec issigonis in 1959 was inspired by a design challenge and the new MINI Hardtop 4 Door is no different. Today, the past and future come together with the MINI Superleggera™ Vision. The stunning roadster concept combines the tradition of classic coachwork construction of Touring Superleggera™ with MINI’s authentic British styling to create timeless aesthetic appeal. First shown at Concorso d’Eleganza Villa d’Este 2014 in Milan, the MINI Superleggera™ Vision will serve as a visual centerpiece of the potential future of the brand. It is also the first time the sporty roadster concept will be shown in the U.S.
Also at the Los Angeles International Auto Show, MINI management will be presented with two Residual Value Awards for the MINI Hardtop and the MINI Countryman models by ALG, the analytics division of TrueCar, Inc. and the industry benchmark for projecting future vehicle values and depreciation data. The annual ALG Residual Value Awards honor the vehicles and brands that are predicted to retain the highest percentage of their original price after a conventional three-year period. MINI will also use the event to showcase the brand’s newest integration with Spotify, one of the world’s most popular streaming music services. Spotify will now be available in all MINI vehicles that feature the MINI Connected infotainment platform. For more information including pictures, videos and technical information on the new MINI Hardtop 4 Door and the MINI Superleggera Vision, please visit MINIUSANEWS.com. What's New About The MINI Five Door? L.A. Times Says 2014 MINI "Goes Mainstream"
What Can You Fit In A 2014 MINI Cooper S? New MINI "A More Practical Car"